I have had some questions about the possibility to purchase Esparducam boards and also about the bill of material. While I am looking into selling spare boards, here are some instructions about building the boards. 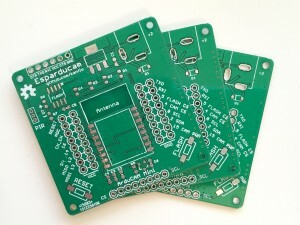 Here is the link to order the PCBs [dirtypcbs.com]. If you have never tried building surface mounted boards yourself I highly recommend you try it! I started here [nathan.chantrell.net] and googled my way from there. If you feel brave you can bypass the diode by placing a blob of solder across SJ2 on the back of the board. R6 and R7 was going to be a voltage divider that I messed up leaving R7 optional. Please note that the PIR does not work at 3.3V. To bypass this without adding a 5V regulator I simply feed the PIR with the raw board voltage which in my case is 5V. If you want to be able to control the power to the Arducam Mini board you need Q2 and R5. If you feel ok to have power constantly enabled simple place a blob of solder across SJ1 at the back of the board. The external SPI flash is also optional. Please note that the footprint is somewhat too narrow, some flashes might not fit.